Dr. Yu-Hua Tseng’s research is focused on understanding the physiological role and therapeutic potential of the energy-burning brown fat and its related beige fat, an area of great significance to both diabetes and medicine, as a whole. 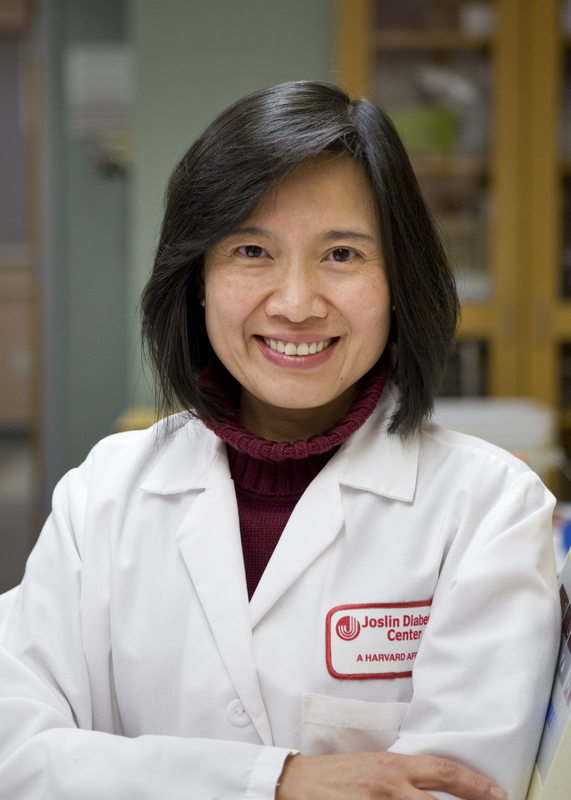 Dr. Yu-Hua Tseng is a Senior Investigator in the Section on Integrative Physiology and Metabolism at the Joslin Diabetes Center, a Principal Faculty at Harvard Stem Cell Institute, and an Associate Professor of Medicine at the Harvard Medical School. Dr. Tseng received her doctorate in Developmental Biology and Cellular and Molecular Biology from the University of Wisconsin-Madison and completed postdoctoral training at Joslin Diabetes Center, Harvard Medical School. Dr. Tseng was an Eleanor and Miles Shore Scholar in Medicine at Harvard Medical School and received the Hazel K. Stiebeling Lectureship from Florida State University and the Armen Tashjian Award for Excellence in Endocrine Research. Matt Lynes is an Instructor in Medicine at Harvard Medical School and a Research Associate at the Joslin Diabetes Center. Matt has an undergraduate degree from Colby College and a graduate degree from Boston University. Matt studies how humans and animals metabolize the food that they eat and how their bodies control the flow of metabolites to direct energy for either usage or storage. He is the recipient of NIH F32 and K01 awards, as well as an Early Investigator Award from the Endocrine Society. Farnaz received her bachelor’s and master’s degrees from the University of Tehran, Iran. She obtained her Ph.D. in Developmental Biology and Regenerative Medicine from Max Planck Institute for Biophysical Chemistry in Göttingen, Germany. She joined Dr. Tseng laboratory in 2015. Her research interests revolve around transcriptional regulation of adipose tissue development and function. Farnaz is a recipient of the American Diabetes Association postdoctoral fellowship. Chih-Hao got his Ph.D. degree from Institute of Biochemistry and Molecular Biology, National Yang-Ming University, Taiwan in 2014 and joined the lab in 2016. His research interests are in mitochondrial biology, CRISPR engineering, and metabolomics. He received a scholarship and travel awards from the American Diabetes Association (ADA), Keystone Symposia, and Joslin Diabetes Center. Justin is a second-year postdoc in the Tseng lab. He received his BS in Microbiology from Michigan State University and his Ph.D. in Molecular Biology, Microbiology, and Biochemistry from Southern Illinois University. His doctoral research focused on energy metabolism and aging. His current research focuses on gene regulation, lipid transport, and aging of brown adipose tissue. Satoru graduated from medical school from Osaka Medical College and has been working as a pediatrician for the past 10 years in the Department of Pediatrics at Kyoto Prefectural University of Medicine in Japan. He came to the Joslin Diabetes Center on the Japanese Manpei Suzuki Diabetes Foundation Scholarship in order to gain more experience in basic research. His long-term goal is to translate the research experience gained here to clinical practice to combat pediatric obesity. Tadataka received his DDS and Ph.D. in Dentistry from Osaka University and has been working as a dentist and oral surgeon over the past 10 years in the First Department of Oral and Maxillofacial Surgery at Osaka University. He joined the Tseng laboratory in 2018 through the Japanese Sunstar Foundation Scholarship. His current research interest is the artificial stimulation of BAT thermogenesis through the use of optical techniques. Sean received his BS in Molecular Toxicology and Environmental Science from the University of California, Berkeley and his Ph.D. in Pharmacology and Toxicology from the University of California, Davis. His current research interest is to understand how lipid mediators regulate metabolic disease and brown adipose tissue physiology. Marsha is a third year Ph.D. student in the Biological and Biomedical Sciences (BBS) program at Harvard Medical School. She is from Indonesia, and she did her undergraduate at MIT in biology. Her background is in molecular biology, and her current research interest is in the role of the gut microbiome in obesity, metabolic syndrome, and type 2 diabetes. She received her BS in Biology at the Massachusetts Institute of Technology in 2016.